Mail call brought us quite the loot tonight. Here is Friday night’s unboxing! In this parcel from BluMaan we found the still very new Monarch Matte Paste (pomade) alongside an elegant addition to their product offering; the dopp bag or toiletry pouch. BluMaan is very much about style. Yes, it starts with hair, but thinking about the accessories surrounding the hair ritual is not something many brands do. I find it to be an extremely nice touch as well as a beautifully done bag. Shout out and thank you to Stephen at BluMaan for making this review possible! The next video are my first impressions about the dopp bag itself. A dopp bag is your essential companion to log your toiletries, to the office, gym or on that weekend getaway. The guys at BluMaan took it upon themselves to come up with an appropriately stylish solution, a dopp bag all of their own. 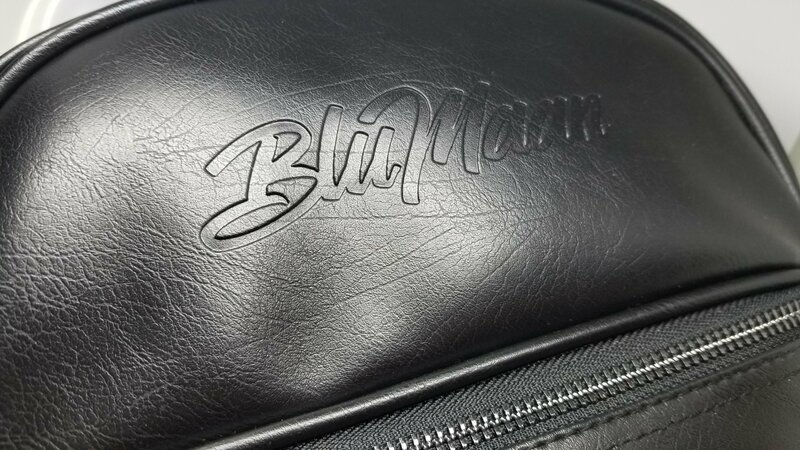 This bag is without a doubt representative of the BluMaan brand name. In its elegant and classic black finish along with a very tastefully stamped “BluMaan” branding, it says: I am a gentleman. There are times when you want or need your accessories to work with that classier version of yourself. This is the bag for those moments. The purpose of this dopp bag is to compartmentalize your grooming gear. It has a main pocket that you access via a zipper from left to right. There is a secondary compartment on the bottom that is also accessible via a zipper. The bag is made of a PVC leather. Very nicely done and you might mistake it for leather. Through the Instagram side of Style4men.ca I have gradually revealed more of my Greaser/Rockabilly Memorabilia buff persona. This might lead you to wonder what attracted me to BluMaan? Clearly BluMaan is a modern and elegant brand! Usually the modern brands focuss solely on that elegant presentation and it might be just a little too perfect. There is no room for originality and humour. I can’t help but smile from ear to ear when I am holding a BluMaan jar. The art is so original and humorous that you just have to appreciate. That is exactly what drew me in. This also says that as polished as the BluMaan branding is, there is also that element were they are not taking themselves entirely seriously. There is fun to be had along the ride. That fun element was the attraction. Then once you try their products the convincing process completes itself with the great styling results you can achieve. In closing this dopp bag scored full point for it’s practicality and good looks.